Indy-Diedel van de Blessewichof. Home name Twister. Baby class 1 Exelent, best baby of breedt. Indy - Diedel v.d Blessewichof. And 1 point of junior champion. 19/072014, internationale dogshow Liege (Belgium). 03/08/2014. Intenationale dogshow Leuven, (Belgium). Junior class, 1 exelent. best female. And today, BELGIUM JUNIOR CHAMPION. Junior class, 1 exelent, best female. 31/08/2014. Open show KC Zoetermeer. Junior class, 1 exelent, best female. BOB. Best junior off show. And place 2 in groop 2. Junior class, 1 Exelent JCAC. Junior BOB. BOS. Benelux Junior winner and Benelux winner. Grufts nominatie. 09/14/2015. 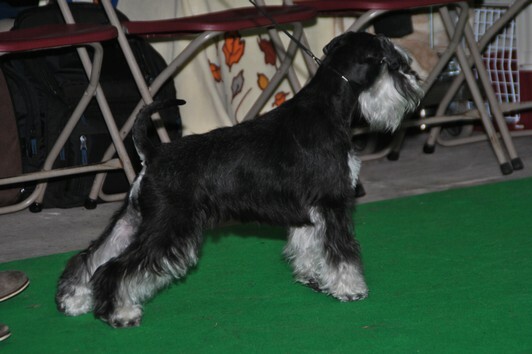 Show Dutch Schnauzerclub. Best female. Indy -Diedel van de Blessewichof. Junior class. Res CAC. Judge P Roosenboom. Junior class. 1 exelent Res CAC, JBOB. Midle class class. 2 Exelent. 2 excellent Res CAC.Res CACIB. 1 excellent. CAC. CACIB. BOB. 1 excellent. CAC. CACIB. BOS. 2 excellent. Res CAC. Res CACIB.